This week we’re sharing the first of several taster recipes from our newly published Fishwives Cookery Book from Goatsbridge, a fish recipe book that is now available from our online store. This smoked trout recipe with courgette is one of Joanne Donohoe’s (AKA Fishwife Number 23) favourite quick fish recipes; we hope you’ll enjoy it too. To make the courgette fritters, place the grated courgette in a colander, or sieve, set over a bowl and sprinkle lightly with one teaspoon of salt. Allow to stand for ten minutes. Using your hands, squeeze out as much liquid as possible and transfer to a large bowl; add the flour, one egg, and the spring onions. Season with salt and pepper and stir to combine. Heat the oil over medium-high heat. Once the oil is hot, scoop four tablespoons of the courgette mixture into the pan, pressing them lightly into rounds and spacing them at least two inches apart. Cook the courgette fritters for two to three minutes, then flip and cook for another two minutes until golden brown and cooked throughout. Transfer to a paper towel and immediately sprinkle with salt. Meanwhile, poach the two remaining eggs for approximately four minutes, until runny, or to your preference. 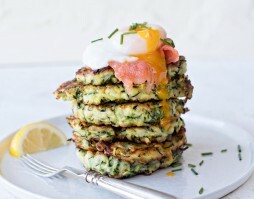 To assemble, divide the fitters between the plates, top with the smoked trout, the poached egg and the chives. Season with salt and pepper.